To add a new schedule, follow the steps given below. 1. 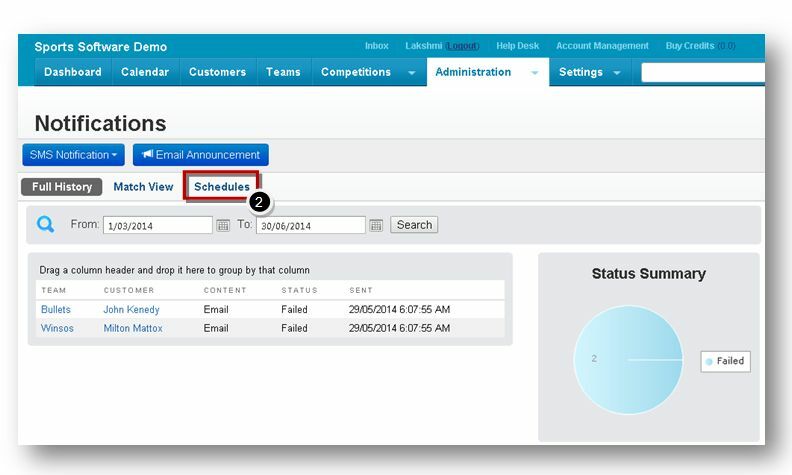 Navigate to the Administration - > Notifications option in the Navigation Menu. The Notifications page will be displayed. 2. Navigate to the Schedules tab. The Schedules page will be displayed. 3. Click the Add New Schedule button. The Competition Notification page will be displayed. 4. 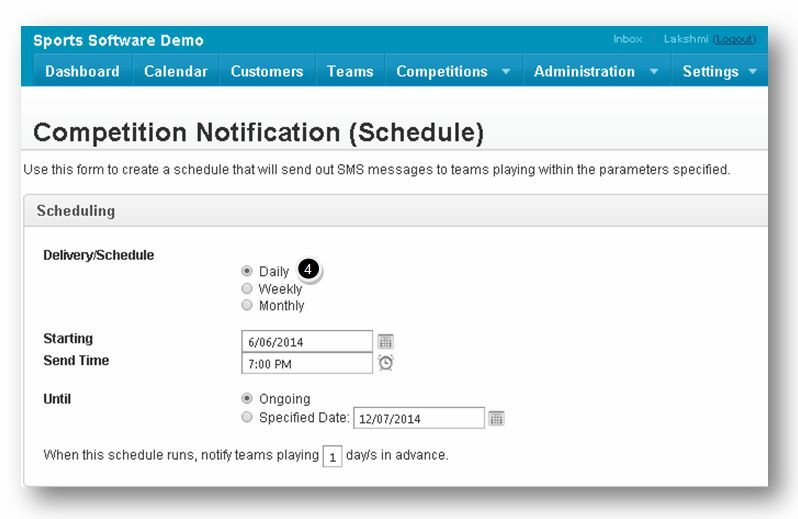 In the Scheduling section, select the required option for scheduling the notification in the Delivery/Schedule field. The available options are Daily, Weekly and Monthly. Accordingly, the additional fields are displayed. Note: For Weekly schedules, you need to check the days of the week on which you wish to schedule sending of notification. 5. 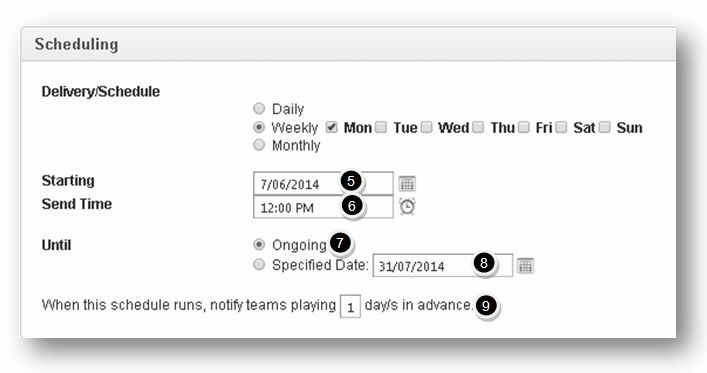 Select the starting date for scheduling from the Starting calendar. 6. Select the time for scheduling from the Send Time clock. 7. Specify whether the schedule is ongoing or not by checking or un-checking the Ongoing option. 8. 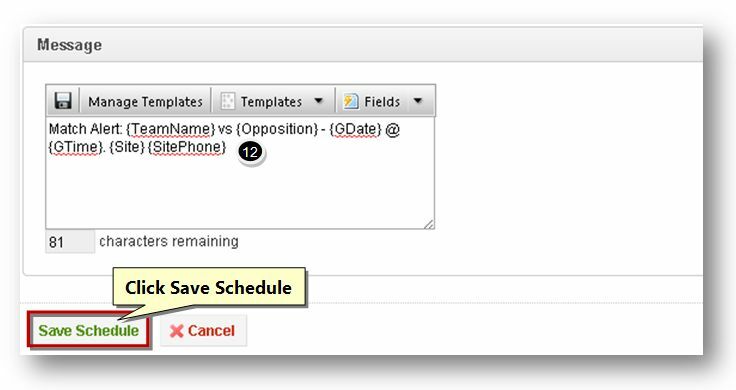 If the schedule is not Ongoing, then specify the end date for the schedule by checking or un-checking the Specified Date option and then selecting the date from the Date calendar. 9. Enter the number of days in advance for notifying the teams playing in the competition. 10. In the Filters section, select the competitions to send notification by choosing the appropriate option. To send notifications about all competitions of the day, check the box in the All Competitions Playing on This Day option. To select the required competition, check the box in the Custom field and then select the required competition from the drop down list. Note: Only the matches played on the specified day within the selected competitions will receive a notification. 11. 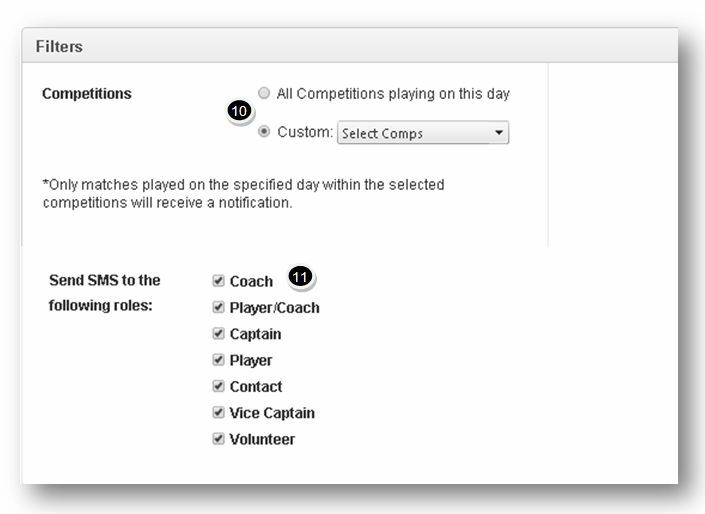 Select the required roles to which you wish to send SMS in the Send SMS field. 12. Enter the message in the Message text entry box. You can use the template and fields to customise the message. 13. Click the Save Schedule button. The message box informing you about the successful saving of the record will be displayed. 14. Click the Continue button. The new schedule will be successfully added.